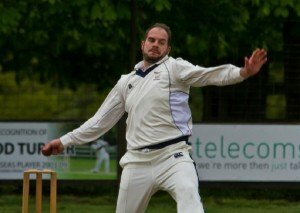 A strong all-round team performance clinched a much-needed win for Knebworth Park in beating Harpenden II by 42 runs in their Division One match. Choosing to bat first on a fine batting surface and rapid outfield at Harpenden, the Park set off like an express train at almost ten an over. Openers Mo Asif (33) and Josh Roseberry (30) tore into the home team’s opening attack in a stand of 66 which meant Harpenden resorted to spin for most of the remainder of the innings. Tariq Umair (52) played the anchor role with an invaluable innings while all the other batsmen made starts without kicking on, David Steadman (29) and Ryan Skeggs (20) being the best. Umair had a useful partnership of 49 for the fourth wicket with Steadman that had the Park well-placed at 158 for 3 but thereafter wickets were falling at regular intervals, leaving them with a potential total well below par at 211 for 9. Then, a terrific unbeaten last wicket stand of 40 between Mo Ali (22) and Sam McCrow (18) lifted the total to 251 for 9 – still much less than they wanted. Opening bowlers McCrow, pictured, and Gareth Jones restricted the Harps openers. That set the stage for Mo Asif whose terrific spell of slow bowling of 3 for 26 in ten overs in tandem with skipper Guy Warman (3 for 42) left Harpenden on the rack at 77 for 6. The home team rallied with a seventh-wicket stand of 108 between Nick Winchester (26) and the unconventional but highly effective batting of Josh Sambrook (67) which was finally broken with a smart run out of Winchester by ‘keeper Umair. Jones was brought back into the attack and bowled Sambrook to finish with economical figures of 1 for 31 in nine overs. McCrow bagged two wickets to complete the task, ending with 2 for 46 and helping to dismiss Harpenden for 211. The win by 40 runs keeps them one off the relegation places but close behind the teams above them. A failure to take their catches proved costly as the Seconds lost a close game against Lutonians by three wickets. Their missed opportunities would have made what was a difficult run chase even tougher for the visitors in the face of some good Park bowling from young opener Ollie O’Brien (4 for 30) and off spinner Graham Fisher (2 for 46). Alex Richmond also pitched in with 1 for 25. Earlier the batsmen also didn’t take full opportunities of the conditions with a succession of careless shots meaning they were all out for a well below par 139 with Archie Stephens (22) and Lewis Hutchinson (37) the only players to make much headway. A valiant effort by Spencer Bayford, who made his maiden league fifty, was not enough to stop the Thirds falling to the bottom of division 7A as they lost their clash against fellow strugglers Totteridge Millhillians III. After being asked to field, the depleted Park bowling attack were put to the sword from ball one as they struggled to contain the attacking Totteridge batsman. Wickets did fall at regular intervals, though, with captain Ian Woods finishing with figures of 4-63 from his 10 overs. However none of the bowlers was able to restrict the runs, despite Danny Digweed (2-41) coming on to pick up his first ever league wickets. There were also wickets for Kunal Sharma (2-49) and Mark Taylor (1-54) as Totteridge bludgeoned their way to 271-9 from their 50 overs. The Park response got off to a bad start as they lost two early wickets but Bayford and the returning Tom Hills began to build the Park innings as they moved the score to 94 before Hills was dismissed for 19. With the scoring rate going along at four an over and wickets in hand Park looked like they could reach their high target. However, wickets continued to fall in clusters and when Bayford was dismissed for an excellent 64, only his father Pete Bayford (20) and Bobbi Orlandi (15) put up any resistance against the Totteridge attack before the Thirds were dismissed for 158 in the 43rd over. With the half-way point of the season approaching and the team in trouble, Park will need to find their efforts from earlier in the season if they are to survive another year in division 7A. The Fourths came to rue careless batting that allowed their three best batsmen to fall prey to two overs of uncontrolled, over-pitched leg spin bowling as they slipped to an eight-wicket defeat at Hertingfordbury. Phil Wheeler (24) and James Roos (21) had struck an impressive 57 for the first wicket when they were suckered by full tosses from erratic leg spinner Short’and then the hard-hitting Jonathan Cirkel followed them to a good catch. Chris Johnson, with a carefully compiled 19, shepherded the middle order, supported by Catherine Cirkel (11) and Dean Digweed (14) before Richard Wheeler and Ian Murrill with ten apiece struck a flurry of runs to take the score to 138 for 6. The home team’s powerful opening batsmen were rushing to victory before Ethan Murrill had opener Spong brilliantly caught by Digweed. Catherine Cirkel, with an excellent spell of 1 for 27 off eight overs, had the other opener bowled. Bella Hopcraft, another of a crop of county girls playing for the Park, bowled impressively with 0 for 32 in seven overs as the home team, conscious of their own team’s depth in batting, moved cautiously towards a victory by eight wickets.